This is essentially a budget hotel that fulfills several aspects and amenities of a mid range hotel. Located at the prime spot on Pantai Tengah Beach (actually at the southern end of Pantai Cenang), all facilities like shops, restaurants are just a few yards away on the road. But this area is quieter than the central area of the Pantai Cenang and the beach is relatively less crowded. The famous Underwater World, the duty free shopping centers Zon & Coco Valley, and the fast food outlet Mc Donald are all very close by and within easy walking distance. As you enter through the front gate and look around, one thing you will quickly observe is the resort's keen focus on the tropical gardens and the lush greenery. There is a pathway inside the resort that leads down to the beach (about 20 meters away). As you walk along the pathway, the lush tropical gardens created in Balinese style, the blooming flowers, the stoned statues, the water fountains and the small lily ponds create a serene and magnificent ambience. The staff really take delicate care of the gardens. And you will see plenty of garden artwork almost everywhere in the resort. Sunset-I is 30sqm in size and has a double bed and a sliding extra bed. The resort has 4 such rooms. Sunset-II is similar in size but has only one double bed. There are 12 such rooms. Sunset-III type is the smallest (18sqm) with 8 rooms. The 4 nos. of family rooms offer two side by side double beds and a sliding extra bed. All rooms have front patios offering nice view of the tropical gardens. The rooms have amenities like air conditioning, TV, Tea/Coffee Maker, Mini Fridge, daily two bottles of free water, bath with hot & cold shower etc. 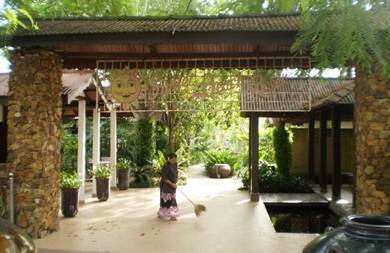 The housekeeping staff make the beds everyday and clean the rooms. However they mostly sweep the rooms and won't mop them daily unless you ask for it. They will also change the towels whenever you want them to. The breakfast in the resort is complementary. The dining area is nice and airy. Although there aren't great choices in the buffet breakfast, it's adequate for most. You will get breads, cereals, fruit juice and cut fruits, dry noodles prepared in Malay style, jams & butter and eggs to order. The front desk is very helpful and can organize all kinds of island and boating tours at a reasonable price. There is a beachside massage kiosk where the resort offers massage. 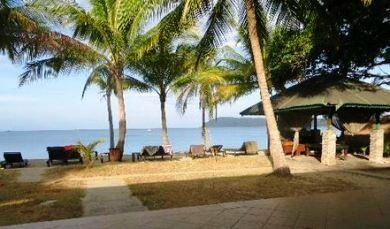 The beachside lounging area under the swaying coconut trees is wonderful and gets full quite quickly. So if you plan to take a lounge chair, go there early as number of lounging chairs are limited. You can see plenty of water sports activities along Pantai Tengah Beach including parasailing, jet skiing, banana boating etc. However the view of the sunset from here is amazing. After the sunset when the breeze starts blowing and the heat is gone, take a walk along the beach - it's a great feeling. Right next door along the beach is Oasis Bar & Restaurant serving great Malay & Indian food on the beach. On one of the evenings, enjoy some cocktails or beer at Oasis (very reasonably priced) and have a candle lit dinner on the beachside. The resort offers complementary WiFi at the lobby area. However if your chalet is close to the reception, you can get good internet wifi connectivity from the room as well. It's a clean well maintained hotel. The tropical garden is really wonderful and very carefully maintained. It adds to the overall tranquil and serene ambience. The beach is only about 20 meters away. Great private lounging area under swaying coconut trees - picturesque setting. The sunset view from here is amazing. The location - all the stores and restaurants are on the main road within yards. So in the evening you can just stroll along and enjoy the warm ambience of the shops and many establishments on both sides of the road, choose a bar or restaurant and enjoy a drink and your dinner. The staffs are really friendly and helpful. The ladies at the front desk are very caring and will guide you with any questions or problems that you may have. I know in several occasion they have even quickly changed the rooms of guests on request. If you ask, they will also suggest nice restaurants around, great tours etc. The rooms are very basic. Sunset-III type rooms are extremely small and to some it may appear like a cell with hardly any walking space around the bed. Most rooms have no views from the windows. Since the chalets are not detached, you may get disturbed if there is a noisy family in the adjacent room. The breakfast is basic and can include some more items like bacons, sausages, mash etc. Sunset Beach Resort is located at northern end (beginning of Pantai Tengah) and close to the Underwater World. It takes about 15 minutes from the airport to reach by car.